Umbria: A free chart offers an alphabetical list of all Umbria wines reviewed for the tasting report in this issue. WineSpectator.com: BONUS VIDEOS Veneto Primer: Marilisa Allegrini walks you through the basics of her northern Italian region's key appellations and wine styles: Soave, Valpolicella, Recioto and Amarone. Alphabetical Guide to Piedmont - More than 640 wines were reviewed for this report. WineSpectator.com members can access complete reviews for all the wines tasted using the online Wine Ratings Search. WineSpectator.com: BONUS VIDEOS Discover the Piedmont region with the best in Barolo (and Barbaresco, Barbera and more). Dive into our videos on Top 10 wines, the Gaja family, leading Barolo wineries such as Aldo Conterno and Renato Ratti, and high-altitude-vineyard specialist G.D. Vajra, among others. FREE: Umbria Alphabetical Listing - More than 120 wines were reviewed for this report. A free alphabetical list is available. WineSpectator.com members can access complete reviews for all the wines tasted using the online Wine Ratings Search. WineSpectator.com: BONUS VIDEO Off-The-Beaten-Path Wine Coming soon: The Umbrian hilltop town of Montefalco is surrounded by vineyards planted with the Sagrantino grape. Learn about the unique wine styles with Marco Caprai of Arnaldo Caprai winery. FREE: California Rhône Alphabetical Listing - More than 630 wines were reviewed for this report. A free alphabetical list is available. WineSpectator.com members can access complete reviews for all the wines tasted using the online Wine Ratings Search. WineSpectator.com: Always on the hunt for a bargain? Download Wine Spectator's free Xvalues app, highlighting high-quality, widely available wines at affordable prices. This easy-to-use app for iOS features Wine Spectator's latest reviews in several categories: $12 or less, reds and whites at $20 or less, sparkling values, and seasonal picks. Find it in the App Store. WineSpectator.com: Make smart buying decisions using our Auction Price Database, updated quarterly with the latest data from commercial auctions. WineSpectator.com members can find out what your wine is worth before you sell, and track the recent performance of wines you want to buy. WineSpectator.com: Meet the owners, chefs and sommeliers behind the world's great restaurants and wine lists in our Talk series: Get insights into dining trends, pairing advice and tips on which wines excite them most. WineSpectator.com: Find restaurants with great wine lists in our Restaurant Search. With more than 3,500 award winners, pick the perfect dining spot by location, award level, wine strengths, cuisine type and more. 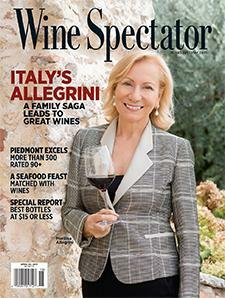 WineSpectator.com: Get expert collecting tips, monitor auction trends and find design inspiration for your home cellar. Discover all this and more in our free Collecting e-mail newsletter, with a new collectible wine pick in each twice-monthly edition. SPRING ENTERTAINING Celebrate the change of seasons and the holidays with fresh new recipes from some of the country's best chefs. Whether you're celebrating Passover, Easter, a birthday or an anniversary, we'll make it easy, with meals just right for milder weather and our editors' picks of highly rated wines. EDITORS' BLOGS Join the discussion as Wine Spectator senior editors plus our team of news and features writers blog about hot topics in current events and wine culture, their latest wine finds, dining discoveries, notes from their travels, conversations with people in the wine business and more. PRIVATE GUIDE TO DINING Our twice-monthly, free e-mail newsletter spotlights the best restaurants for wine lovers, from bucket-list destinations to perfect pizza places. Get great wine picks for dining out, keep on top of drinks trends, learn about new restaurant openings and more. Sign up! Chocolate and Wine: Port is a classic pairing with rich desserts. Senior editor James Molesworth heads to Eleven Madison Park, a Wine Spectator Grand Award–winning restaurant in New York, to taste-test two possible chocolate matches—Vintage Port and tawny Port—with wine director Cedric Nicaise. Which wine gets the nod? Brunello di Montalcino—When to Drink It and When to Decant: Brunello is a big wine that can taste delicious on release, but usually improves with age. When does top producer Emilia Nardi like to drink hers? And if we don't have the patience to wait, will decanting help? 2016 BORDEAUX BARREL TASTINGS The 2015 and 2016 vintages have provided Bordeaux with its first excellent back-to-back crops since 2009 and 2010. Which 2016s will be worth buying as futures? Senior editor James Molesworth will be visiting the region in late March to taste barrel samples of the young wines. Look for his blog posts for highlights from top châteaus. Plus, get his scores and tasting notes for hundreds of reds, dry whites and sweet wines. COLLECTING GUIDANCE Adding to or culling your wine collection this year? Make smart decisions using our Auction Price Database, updated quarterly with the latest info from commercial auctions. Find out what your wine is worth before you sell, and track the recent performance of wines you want to buy. Plus, keep abreast of the latest auction news and market trends in our Collecting section, and sign up for our free twice-monthly Collecting e-mail newsletter. VALUE WINES Looking for wallet-friendly wines for weeknight meals? Didn't get a tax refund this year, or maybe you're planning a major home renovation or sending a kid off to college? You can still drink great bottles without spending a lot. Check our site regularly for updated quick lists of Top Values, Easy Finds and Wineries for Values from around the world.